What’s not to love about dump cake recipes? And this one is in a class all by itself. When you need to serve a dessert on the light side, this fits the menu! The recipe makes 16 servings, with each one providing 127 calories, 0 fat; 0 cholesterol; 29 grams carbohydrate and 1.5 grams protein. With stats like that, you can feel confident to serve it as a heart healthy and/or diabetic-friendly dessert. I always keep a box of angel food cake mix and a can of crushed pineapple on hand to make this dessert at a moment’s notice. Thanks to Jean Chase for posting Photo #6 - a whipped cream and cherry topped glamorized version! Dump cake mix and undrained pineapple into an ungreased 9" x 12" baking pan. Stir together until well blended (see photos). Bake 25 minutes. The top should be nicely browned (see photo) and cake should be pulling away from edges. Do not underbake or cake will sink in center and be too moist. Optional: To serve, dust with powdered sugar or top with a dollop of whipped cream topping. I have made cake many times since first reviewing the recipe. It never disappoints! I love it, not only because it's dead easy, but is not too heavy. It doesn't hurt that it makes me look like a genius in the kitchen, either. Thanks again for sharing! Beauty!! I'm heading back into camp soon, and have been looking for easy, delicious recipes (healthy is good too). Okay, I've made this quite a few times now, and it never disappoints. I love it, because it's so easy to just whip up, and it makes me look like a genius! LOL! Thanks again! It's not the way to make dump cake. There are dozens of ways to make Dump Cake; it's a concept, not a recipe written in stone. Just like the soda pop cake (1 box of cake mix; 1 can of pop) ... it's considered a dump cake - and a very delicious one too. Nobody seems to know why or how it works so well; but it does. I first got this recipe from Weight Watchers, I love to make this for my hubby, he loves it. Made this for Easter dessert. My family loved it. So simple to make. Wanted something light as some of my kids had to go to their in laws first for a brunch. This was just the right dessert after a big meal. Even the 3 yr old asked for a second helping, he is a sweet fanatic. Even the 14 yr old who is not fond of sweets loved this cake. This is so easily made, and it is really good too! If you like simple, it is a must do! How about adding nuts too? I can't believe it! Only 2 ingredients.! Warning! I might put a big pinch of Shredded Coconut in there. Planning on trying this recipe for Thanksgiving. Debbie ~ I did reply to this question when 1st you asked, but I don't see it listed here so at the risk of double posting, I don't want you to think I'm ignoring you and will respond again: Subbing a traditional cake mix would have some problems. They require eggs, oil and water, and while the undrained pineapple has the liquid it has no eggs and oil. It's worth a try though as I have recipes that use a regular cake mix and dump together with canned fruit and butter, etc. There the cake mix is dry but cooks in as a crumb topping. Let's hear from you if you try it and invent a variation that works! I made this cake and made a cream chees/whipped cream topping to serve with it. Slam dunk smash hit. Could you share the recipe for the frosting? Thank you! Great recipe. I love simple with a wow factor; and this is it! I compare it to the soda pop cake (1 box of any flavor cake mix + 1 can of soda; that's all) - Both are awesome. Thank you for sharing. I love the combination and the colden brown look of this cake, can't wait to try this one! Great, easy recipe. Thanks for sharing. Made it, so easy and very good! easy to do and very tasty too. Mmmm! This is so delicious! I made this today and we LOVED it! My 6yr old son asked for seconds and if he could have a piece for breakfast tomorrow. After seeing your last picture with icing and cherries, I added to your recipe. I added 6 Tbsps of chopped Maraschino cherries to the batter, it was wonderful. Next time I'm going to add cherries and coconut. Thanks for sharing! So glad it was a hit, Denise. I recently celebrated a birthday and a good friend made this for me knowing it is one of my favorites. She also added chopped maraschino cherries, and with the crushed pineapple it was very reminiscent of pineapple upside down cake. HUGE Angel food cake fan and also love anything with pineapple in it. Can't wait to try on boyfriend. this was my Mom's favorite cake! It is a staple in my house! my box of Angel Food Cake has to packages, the egg white part and the flour part, do I mix packages together and then mix in crushed pineapple? I have never tried this recipe with the 2 envelope packet version of angel food cake mix (which I don't even see for sale anymore.) You can be the first and report back on it! Yes, you would just mix the 2 cake mix packets together in the pan, then stir in the pineapple. I think it would work fine because the ingredients are all the same. Let us know how that turns out! I tried it but was not too impressed. A friend of mine liked it but this friend will eat anything, good or bad, lol. I may try it again if I find the single package type of angel food cake, but will never make the double package type of angel food cake mix for this cake. thanks you. where did you find the mix with 2 envelopes? I prefer this but can't find it anymore. I've been making this for many years....not sure where I got the recipe. I started adding 1/2 cup of flaked coconut and it really kicks it up a notch! Pina Colada!!!! And served with a dollop of Cool Whip....yummo! Linda ~ what a great tip. I love coconut and if unsweetened coconut is used this is still a very good choice dessert for Diabetic-Friendly and Heart Healthy. I believe Weight Watchers used this recipe years ago, though that's not where I came across it. LOL, Just my luck that I find the type that no one else has found. OK, I will try and let you know what happened. Ty for your quick reply. Happy Halloween all!!! Has anyone tried this in a bundt pan? Bobbi ~ this cake is mixed in the pan it is baked in, so trying to mix it in a bundt pan would be awkward because of all the ridges; seems it might take too long to get cake mix and pineapple stirred sufficiently without overmixing. If you prepared it in a bowl and poured into the bundt pan that would probably work. But the baked cake texture is light and loose, not the compact cake texture we think of as a bundt cake. That being said, using a bundt pan for this cake is an intriguing idea.....and you could be the first to try it out! I needed 2 lite desserts to follow traditional St. Pat's dinner tomorrow. Now need only one more. Thane you, heading for the kitchen now! Looks something my kid and i would enjoy making together. Will sure try this! You would have a brand new creation if you did! The standard cake mix requires eggs, oil and water; while the pineapple has some liquid, there's no eggs to aid in leavening and richness. I think you could tinker with your idea and come up with a variation but I wouldn't suggest doing that for a special occasion until you've worked out the specifics and it's foolproof. Good luck and if you succeed, please share! Susan, a cake you can take to parties and funerals too, and which doesn't blow everyone's calorie count is perfect! Thanks for your feedback. Made this last night for dessert after a casual grill party on our screen porch. Today, I am baking another one to bring to a funeral reception. Everyone loves that it so easy to make and not as many calories as other sweet desserts. Donna ~ Thanks so much for your review, and I am glad you enjoyed it. Some day I'm going to get brave and try it with other fruits. Valerie ~ I'm delighted the cake hit the bullseye for your Easter dinner. And to have satisfied the kids too, is frosting on the cake, pardon the pun! I also can't wait to try this !!! 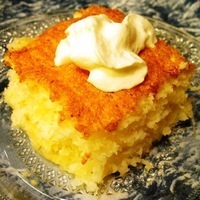 With cholesterol in the family Angel food cake and Pineapple~Two wonderful ingredients!! YUM I'm sure!!! Thank-you so much! I cant wait to try this. I was thinking about making it for Easter. Thanks for sharing this recipe with us.